Click HERE for the Campaign. Following our appeals on Twitter, Ms. Federica Salsi, one of the Council Members for the City of Bologna, sent a reply advising us of the (very disappointing) response from the Assessor responsible for this matter. The Assessor’s response basically reads: “The agreement has been signed for a co-operation on matters of economy, technology, culture and youth policies, and not for those concerning animals”. 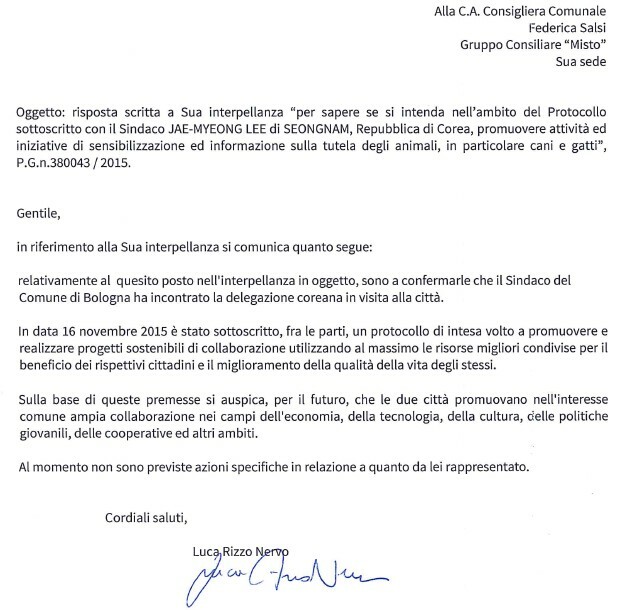 Which summarized, translates as: She explains her disappointment about Mayor Merola’s silence and the Assessor’s declaration, and about the bad publicity Bologna is receiving for having signed a partnership with Seongnam, a city in which there is a terrible trade of cruelty inflicted on dogs and cats. She commented on the petition (its objects and aims), highlighting that, in only one day, it had already received over 2,000 signatures – she realized that it is not a good thing for Bologna to receive a petition signed by thousands of strangers! She also hopes that the “Consulta Animalista” (a new city body created to protect animals in Bologna) could take action with Seongnam and do something against its dog meat trade. Please send a thank you message to Ms. Federica Salsi, on her blog page, for speaking out against the terrible cruelty. Click HERE to post a Thank you message. Below are sample “Thank you” messages you can use. Please click HERE to take the action today to speak out against the torture and killing at the Seongnam Moran Market. Cruelty that is done to any innocent being is evil and must be stopped!!! The best way for evil to prevail, is for good people to do nothing!!! MY GOD THIS WORLD IS HELL FOR ANIMALS , THERE ARE SOME COUNTRIES WITH MORALS BUT IF THE TRUTH BE KNOWN ANIMALS SUFFER EVERYWHERE IN EVERY COUNTRY. THIS SICKENING VILE CRUELTY TO DOGS AND CATS IS BEYOND IMAGINATION AND THE MOST EVIL I HAVE SEEN BEING DONE TO DEFENCELESS SENTIENT CREATURES. Stop all the torture and murder….dogs are our friend and companions and should never be treated like this. You will be judged for all of this someday and will pay for you actions.